Docklands: I can hear the crowd yelling, 60,000 strong. Etihad stadium is about 1 k away and the wind is not favouring the crowd. Still, energising. Like a wave. It reminds me of the place we used to live, Wellington Crescent, on the east side of CBD. It was a rotten apartment, but we sure had some fun in the neighbourhood. 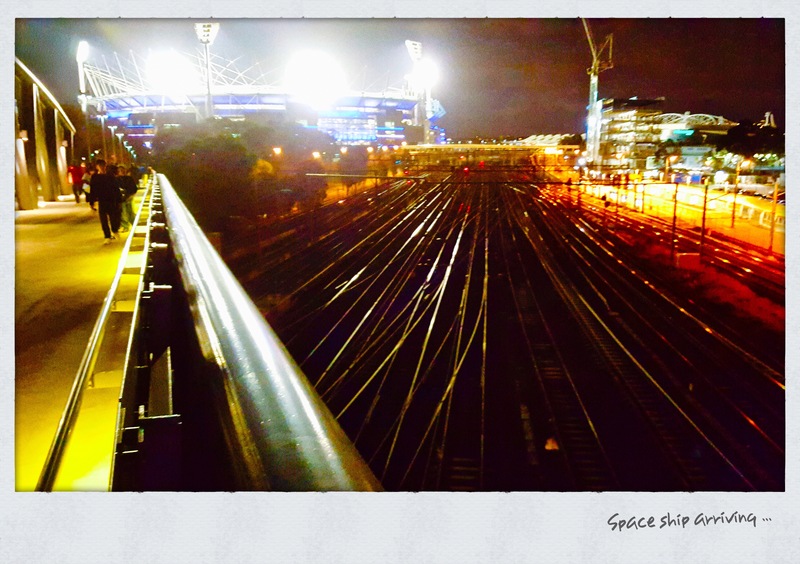 Right after we arrived in Melbourne we were invited to go to the “footy” in the MCG. Our first Ozzie adventure. And as we lived right around the corner, we walked. It was a warm evening, September being spring. And the closer we got, the more I had the idea I was watching Star Trek or some other sci fi movie. Everything was vibrating, shimmering, out of focus. Lights and colours and noise and … overload of impressions. Of course I brought my iPhone, it being my camera of choice. And right when we crossed the railway tracks I suddenly saw what I felt: a space ship arriving.